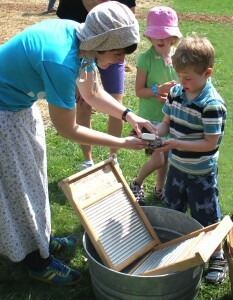 This spring brought many wonderful programs to the Aldo Leopold Nature Center, and the Spring Vacation Day programs were a special highlight. Every year during the spring breaks for the Madison area school districts, ALNC holds all-day programs for students ages 5-12, where they explore a range of science and nature topics, observe the spring habitats, and learn from ALNC’s experienced team of naturalists. This year’s participants during the Pioneer program day had an extra special treat when Kathe Crowley Conn, a local author, visited to share her new book about fascinating life of Juliette Kinzie, a pioneer and frontier author who lived in early 1800’s Wisconsin. Juliette Kinzie: Frontier Storyteller, published by the Wisconsin Historical Society Press, follows Juliette’s journey from a comfortable life out east in the early 1800’s to a rugged log cabin in what would later become Wisconsin. Conn shared passages from her book, painting a vivid picture of Kinzie’s life for the students. 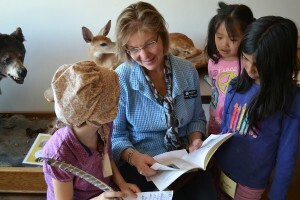 Some favorite moments for the audience were when Conn shared the story about Kinzie’s ‘pet’ deer and when she shared a replica letter that Kinzie penned by hand and beautifully folded. The students were encouraged to imagine how they would have felt traveling to pioneer-era Wisconsin, and had many great questions for Conn about Kinzie’s life, hobbies, and legacy. 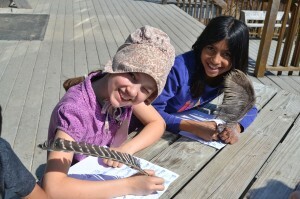 The students then got to try writing letters with feather pens themselves. What a wonderful way to spend the day, exploring and learning about a fascinating character in Wisconsin’s history!